Yarrows are hardy, easy-care, versatile perennials which bloom reliably from late-spring through the summer, sporting large, flat flower heads with masses of tiny daisy flowers in white, yellow, pink, rose or red. 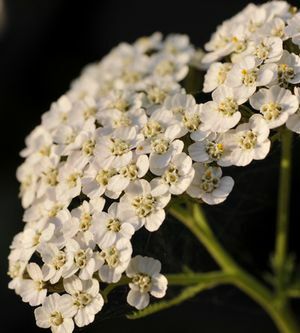 Yarrow looks good in the middle or at the back of formal flower beds and borders and works very well as part of a butterfly garden or traditional cottage garden. The feathery foliage and showy flowers are great additions to fresh cut flower arrangements and will keep their form and color quite nicely when dried. 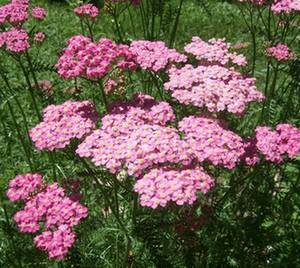 Yarrow tolerates poor, dry soil but does best in well-drained, sunny locations. Rich soil encourages thick foliage but fewer flowers. Taller species may need staking in exposed, windy areas. You can cut yarrow down to the ground in autumn, or leave the flower stalks standing for winter landscaping. Sew seeds directly in the garden in late spring, or divide existing clumps in spring or autumn. I’ve found that an overgrown patch of yarrow benefits a great deal from division and the new plants will settle in and grow quite readily in another spot. Allow two to three feet between new plantings to allow for their spreading growth. Achillea filipendulina (fernleaf yarrow) has soft, fern-like foliage and clusters of yellow flowers. Height averages 3-4 feet tall, with leaves from 8-10″ long. Gold Plate is a densely foliaged, tall variety, reaching 4′ to 5′ high, and bearing enormous six inch flower heads which appear in June to September. Coronation Gold is smaller, growing 3′ high with grey-green foliage set off by compact mustard-yellow blooms all summer long. With strong stalks that seldom need staking, this is a great choice for dried flowers and borders, and is especially suited for areas with hot, humid summers. Moonshine offers an even more compact choice, growing from 1.5′ to 2′ high, with silvery leaves and lighter-hued, canary yellow flowers. Parker’s Variety stands 3′ to 4′ tall, with an open structure, strong stems and golden yellow flowers. Achillea millefolium (common yarrow) ranges from 1.5′ to 2.5′ tall with fine, feathery leaves of 6″-8″ long. This old-fashioned perennial was likely a favourite in your parent’s or grandparent’s gardens – and for good reason, because it is easy to grow and spreads rapidly. Divide every three years, or more often if growth overtakes the bedding space available. Cerise Queen, with oval heads of deep pink flowers, is a strong performer, blooming from early summer through to fall. Grows 1.5′ tall. Fire Queen also stands 1.5′ high with flowers that open with a white hue which deepens to a rosy red. Its flower heads are 2 to 3 inches across and the leaves are finely textured. 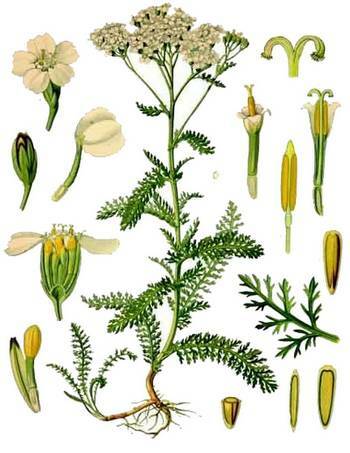 Achillea ptarmica (sneezewort, fair-maid-of-France, white tansy) is quite different to other yarrows, being 1.5′ to 2′ tall, with lance-shaped leaves of 1″ to 4″ long. The common name of sneezewort comes about because the dried root of this plant was used as snuff. Sneezewort can take over its growing space and then some; it may become invasive if not controlled. The Pearl produces lots of creamy-white double flowers in early summer.